to place our complete trust in God. Blessed Josaphata, pray for us. Photos of Blessed Josaphata as well as contemporaneous persons and scenes can be found in our Photo Gallery. Blessed Josaphata was beatified on June 27, 2001 by Pope John Paul II in Lviv, Ukraine. Over a million people witnessed that long-awaited and joyous event. Michaelina Hordashevska was born in Lviv, Ukraine (then-Lemberg Austria-Hungary), November 20, 1869. From early childhood she showed signs of great piety. With her older sister, Anna, she used to imitate hermits by eating the roots of plants. Often, she would run off to a chapel in a nearby forest to pray. In 1887, at the age of 18, after a deep spiritual experience during a retreat, she resolved to consecrate herself completely to God. 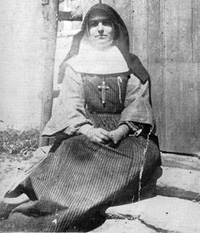 With the permission of her spiritual director, and later co-founder of SSMI, Father Jeremiah Lomnitsky, OSBM, she made a private vow of virginity. Ethnic Ukrainians of Halychyna, living under the Austro-Hungarian Empire, were very poor, both materially and spiritually. Women and children were especially neglected; in the villages, immorality, illiteracy, superstition, and drunkenness were rampant. The only religious order of women, at that time, was the Basilian Nuns, a cloistered order. There was an urgent need for an apostolic congregation of women who would live among the people and continue the work of evangelization initiated by the Basilian Fathers through missions and spiritual retreats. Ongoing - even daily - catechesis was necessary for the religious formation of the people. 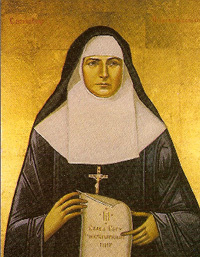 Father Lomnitsky proposed that instead of entering the Basilian Order of Nuns as she had been planning to do, she would become the founding member of a new apostolic congregation that he and co-founder Father Kyrylo Seletsky, pastor of Zhuzhel (now Zhuzheliany), were planning. Michaelina asked for time to pray; to discern whether this was God’s will for her. After a few days, she returned with a courageous answer: if her people needed her; she was willing and ready for any sacrifices and hardships that she might encounter in this new congregation, and above all, she was certain that this was God’s will for her. After a two-month stay with a community of Polish Felician Sisters in Zhovkva, near Lviv, learning the life of apostolic religious, Michaeline received the habit -- which she herself had quickly designed -- of the newly founded Congregation of the Sisters Servants of Mary Immaculate. She took the religious name of Josaphata. The Sisters Servants were thus founded on August 27, 1892 in the humble village of Zhuzhel. Sister Josaphata, remarkably mature at the age of 22, was the first superior and directress of the novitiate. A group of seven postulants was already waiting for her at their new, albeit rustic and nearly bare, convent. The congregation started with almost nothing; but filled with zeal, their numbers grew so rapidly that in ten years there were 128 sisters in 28 homes. Sister Josaphata’s apostolic horizons had no limit – “educate the heart of the people, and serve where the need is the greatest” she said. In 1902, four sisters were sent to Canada to serve the Ukrainian immigrants. By 1906, the Sisters Servants were in Croatia, and by 1911, they were in Brazil. Sister Josaphata charted a new course for a woman’s congregation in the late 19th century. She recognized the needs of her people and found the means to meet those needs. 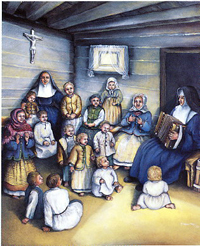 She and her new congregation established daycare centers for children; supplied basic medicines; taught children to read and write; taught the bible and lives of the saints to adults and children; sewed vestments for the clergy; encouraged upkeep of churches, and cared for the sick during cholera and typhus epidemics. Sister Josaphata suffered stoically as her body was ravaged by painful tuberculosis of the bone and she died at the age of 49 on April 7, 1919. Her mortal remains were transferred in 1982 from the closed and abandoned cemetery in Chervonohrad (formerly Krystynopil), Ukraine to the Generalate of the Sisters Servants of Mary Immaculate in Rome. There, hundreds of people come to pray for the intercession of Blessed Josaphata for their physical and spiritual needs. Her intercession before God is powerful. The postulation office has received hundreds of testimonials about graces received through her intercession. Her process of Beatification was officially begun in 1992 in Przemysl, Poland. A major milestone in that process was reached when Pope John Paul II, while making his pastoral visit to Ukraine beatified Josaphata on June 27, 2001, proclaiming her - Blessed Josaphata Hordashevka. Only one miracle remains to advance the process for her canonization. Let us pray that Blessed Josaphata will soon be venerated as a saint for the Universal Church! 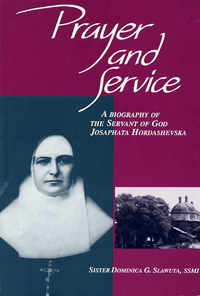 This biography of Sister Michaelina Josaphata Hordashevska, foundress of the Congregation of the Sisters Servants of Mary Immaculate (SSMI), is an expanded 171-page version of the biography first published in 1985. With the fall of Communism in Eastern Europe and the lifting of the Iron Curtain, more information and pictures became available from archives and personal testimony. Especially captivating is the account of the finding of Sister Josaphata's earthly remains, their transfer to Rome, and the ongoing cause for her canonization. Also poignant is the inclusion of reproductions of the eight painted scenes depicting the life of the first Sisters Servants in Ukraine. This book was specially commissioned in celebration of the congregation's centenary in 1992. This inspiring story will move both your heart and spirit. 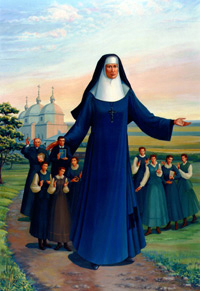 Sister Josaphata was beatified in Lviv, Ukraine on June 27, 2001. Include a clear return address and phone number. Specify whether you would like the English or Ukrainian version. We offer sets of eight, handsome, four-color note cards (inside is blank). Each note card shows a unique painting that depicts the life of our sisters in the early days of the congregation. While portraying how early ministries might have appeared, the paintings also capture quaint nuances of 1890's village life in western Ukraine. The paintings, by talented artist Jeanette Shewchuk of Winnipeg, were commissioned by the Sisters Servants of Mary Immaculate to commemorate the centenary of their founding. The note cards make great stocking stuffers or little gifts! Indicate how many sets you would like and include a clear return mailing address and phone number. The painting shown is entitled, "Day Nursery." Note cards are 4.5" x 6.25" and include envelopes.